There's a new phenomenon creating quite a stir amongst fantasy sports fanatics... DAILY FANTASY LEAGUES! Yes, that's right! You can now play in one day fantasy leagues where you draft a new team each day and are paid out your winnings by day's end! Traditional fantasy sports consist of a group of buddies getting together annually to drink beer, eat pizza and draft their team. A team that they're more or less stuck with for the entire season. Yes, you can make moves via the free agent wire but let's face it... If you draft a bad team or have a key player get injured your season is cooked! We're not suggesting that you call your league's commissioner and call it quits. The annual draft for season long leagues still provides something daily fantasy can't, camaraderie and being able to hide from your wife and kids for a day! 2. Make a deposit. This can be done using your credit card, debit card or paypal account. You will also be given a percentage bonus (free money) on your deposit. These funds will be released in increments based on your play. The reason that they don't credit the bonus in full instantly is because people would hit and run them for the free money without playing any games. 3. You're now ready to pick what type of league you'd like to play in! There are tons of different kind of leagues to choose from in daily fantasy: snake drafts (found at Draftday), salary cap leagues, survivor leagues, double ups and pick'em leagues. Snake drafts are live drafts vs. other people (usually 2, 3 or 6 teams) where once a player is selected, he's no longer available for anybody else to select. (These drafts are also known as serpentine drafts). Salary Cap Leagues consist of 2-1000 players where you're given a set amount of salary cap money and you have to fill all roster spots using your virtual cash. Note: There can/will be multiple teams within your salary cap league that will have the same players. For more info, check out this article explaning how salary cap leagues work. Pick'em Leagues are the most simple way to play daily fantasy. This type of league gives a choice of a small handful of players (usually 8 or so) to choose from within a group. You select one player from that group and then move onto the next group of 8, selecting one player from that group and so on until you've selected a player from each group. 4. Once the last game has played for the day, the fantasy site that you're playing on will tally up all scores and determine a winner. Winnings are then posted to your account, usually within an hour of the final game being completed. It's that easy! 5. Wake up and do it all over again! It should be noted that this new style of play also offers weekly leagues for those looking to get maximum bang (enjoyment) for their buck. 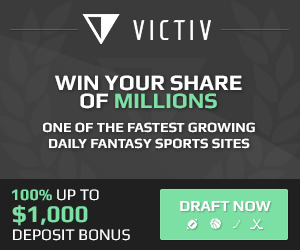 Another great daily fantasy site worth checking out is Draftkings where you get a 100% bonus up to $600 in free money!